How Real is Karate Fighting and can Karate Moves Prepare you for Chaos? Disclaimer: This article Karate Fighting - Preparing for Chaos, deals with the usefulness of the civilian martial art of Japanese Karate in the event of serious and unavoidable personal assault. This website does not advocate the use of unlawful or excessive force in any circumstances. We merely speculate at the effectiveness of Karate technique in the face of unprovoked personal attack. 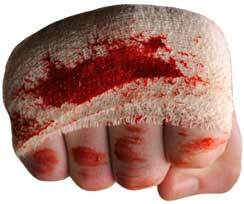 Dojo training, specifically Karate fighting, can be real tough. The physical rewards are; we become stronger and faster, our reflexes sharpen, we build endurance and improve our one-on-one sparring ability. 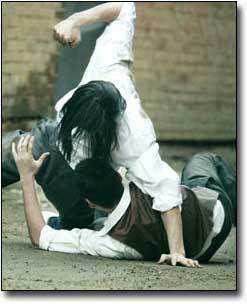 Thousands, maybe millions of repetitions of Karate moves, over years of training to a point where they are hard-wired is one thing, but that may not be enough in the event of a sudden violent assault. Exceptional Karate Technique does not automatically equip you with the reflex skills needed in chaotic situations where there is no time to think. Japanese Shotokan Karate Fighting - Military Style..! As we said, and as you will see in this clip, dojo Karate can be tough.. So What’s Missing in Karate fighting..? 1. Most Karate moves are self-referral. The attacks and defenses practiced in the dojo are done against an ‘opponent’ doing exactly what we do; Karate punches, Karate kicks, Karate strikes and Karate blocks - all in Karate stances. Get the picture? Facing a compliant and emotionally stable partner is a world away from dealing with a street crazy. 2. The element of real surprise is absent. No matter how fast and furious an attack comes at you, no matter how decisively you retaliate, Karate moves - even in high level free-sparring - are predictable. Let’s take a look at both of these and ask if the Karate we do is enough to save us in an all-out street assault. Serious Karateka know a lot about Karate technique. Most Karate black belt holders can generate exceptional speed and power, they already understand the pros of dojo training - they have the chip. I am not about to dissect or analyse this, except to say that the Shotokan karate techniques developed and practiced by the Japan Karate Association (the one I’m most familiar with) are justifiable on technical grounds. Every move can be explained in detail. 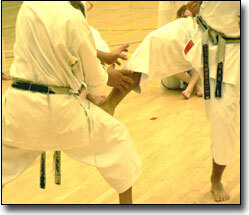 JKA also has some good scenario-based training that takes pre-arranged sparring to a new level. Some of these more advanced Karate fighting drills reduce predictability to a point where things are as uncertain as they can be - in the safety of the Dojo! But whatever we do in the Dojo can never replicate the stress of a real situation. What happens in organised, bare-footed Karate classes just doesn’t happen ‘outside’. Does this mean Dojo Karate fighting can’t equip us for the chaos of the street? Karate is extremely orderly. We dress the same, train on the same smooth polished floor, partner with people of the same height and rank - we even announce our moves and attack in full view of our partner when he is ready. On top of this, there is a system of hierarchy which adds to the orderliness with concepts like courtesy, respect, discipline and humility. All this may contribute to character development, but it is not essential (or even relevant) to out-and-out assault where the sole intention is to cause harm. Contrast the order of the Dojo with the chaos of the street. Most of us have at one time or another been paralysed with fright in a surprise confrontation. A momentary feeling usually a second or two of mind-numbing weakness. In this situation, the brain recognises a problem and the body goes through an instant series of changes where the heart rate becomes elevated and the awareness amplified. Under grave threat, we become temporarily incapable of deciding quickly between any number of possible ‘learned’ actions. When this happens Karate moves won’t be top-of-mind. The victim will not be able to snap into combat mode, in fact he will probably freeze unless he has trained specifically to avoid this reaction. For a person used to Dojo Karate fighting, the experience of sudden shock, such as being rushed, assaulted or just startled by someone, may not be due to a lack of skill. He/she may well possess adequate, even devastating defensive techniques, but the surprise ‘numbing’ element will render his skills temporarily useless. So the question arises - is Karate fighting of any use at all? A full force kick in the face from an untrained overweight hard-man when you are lying on the ground will have the same effect as a beautifully executed Jodan Mawashi geri from a person with ten years Dojo training - it may even have more. Street fighters don’t control their aggression, they don’t pull blows and they don’t wait till you are ready. Under assault, a trained Karateka may not ‘let go’ to the same extent as his attacker(s). 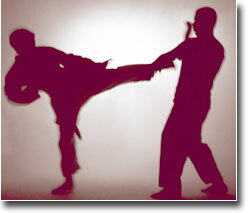 Karate moves practiced in a Dojo are concerned with partner safety - not dealing with a crazed attacker. So what can Karate training routines give us that will get us safely through a dangerous, chaotic situation and save our lives? To have any chance of surviving serious assault, the rules of order must be discarded because you are preparing for chaos! This is the real test of Karate fighting. 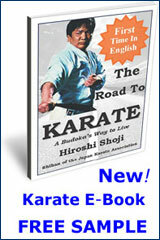 For it to work, the right Karate moves must be executed correctly with the right intention by a person in the right frame of mind. Ikken Hissatsu meaning to kill with one blow is a Japanese martial arts term for one technique applied with a killing mindset. Importantly, this mindset is not a safe or a careful one. It doesn’t take personal safety into account. It is only concerned with survival, even at the expense of personal injury. Increasing the chances of surviving an all-out street assault depends on several critical factors. We can’t prepare for every possibility, but we can strip away what is unnecessary and leave ourselves with a decent chance of survival. Here are few things that must be kept in mind. Choosing from scores of different movements could get you badly hurt or killed. There is no sense in accumulating a library of complicated Karate moves, even if they are solid street defenses. Learning any more than 3 or 4 could be detrimental. Distil complex techniques into their basic elements and master them so that you have complete confidence in their effectiveness in high stress situations. Don’t be concerned with how pretty they look, their effectiveness is what counts. There’s a very good reason for keeping things simple - if you have too many options, you have to choose and choosing takes time. Time is your enemy in the instant when the assailant has the advantage. Your reaction time will blow out if your response is complicated by choice. So hard-wire 2 or 3 moves only. Karateka are very comfortable with repetition and this is an advantage. When new physical tasks are repeated over and over - we integrate them as a result of the complex neural activity taking place in the brain. If combat techniques are properly assimilated, the body will be prepared to act spontaneously in situations where a split second can mean life or death. 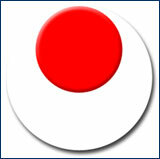 Keep in mind that rapid response training is different to Dojo Karate fighting. Don’t confuse the two and don’t be tempted to introduce anything that could complicate things. I’d fancy the chances of Lyoto Machida or Fedor Emelianenko over anyone limited only to Karate fighting. These guys adapt to whatever situation they are in - that way they stay in control. So learn to respond with fast reflex reactions - because there will be no time for thinking. The environment will be unfamiliar, the number of assailants, whether there are weapons involved, whether you have been wounded, your emotional state, the clothes, eyewear and jewelry you are wearing, the time of day, the weather etc. Count on nothing except chaos. When you are preparing for chaos ground fighting can’t be ignored. As a reluctant street fighter in the big cities of Britain, I was motivated more than anything else to stay on my feet and get it over with very quickly because I hated the prospect of going to the ground. If the assault is not over in a few seconds, there’s a very good chance you'll wind up on the deck - the last thing a Karateka wants. Take another leaf out of the mma fighters book. Get familiar with ground fighting. It’s a lot different to stand-up Karate fighting but you can get used to it quickly. Note In this article, we do not suggest what techniques to use - that’s for you to find out. The right move quickly applied in the right frame of mind will be effective whether you are grappling in the mud or trading stand-up blows. Arrange with a friendly enemy to jump you at a random time and place. Short of going out and looking for a fight - which is stupid and definitely not recommended - one way is to arrange for someone to jump you at a time and place unspecified. Do it away from the sterile Dojo environment at places where a real attack is likely to happen. This takes some creativity but it will introduce the vital element of surprise and remove the chance of getting badly hurt. If it’s done playfully but forcefully, you will quickly get a feel for how you would react in a real scenario. Surviving physical assault starts and ends with the right mindset. I believe that Karate fighting practiced the right way can help you prepare for chaos and give you a good chance of surviving a serious attack. With this you will have a better chance to initiate an immediate life preserving response when there is no other option. The best form of self defense is simply not to be there! If you have the choice DO NOT put yourself into dangerous situations. RUN AWAY if you can. Swallowing your pride is better than swallowing your teeth and you’ll benefit from the exercise!